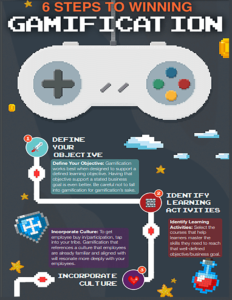 Level up your LMS Gamification knowledge with this engaging infographic. Gamification helps learners engage in content in a deeper more meaning for way. Incorporating gamification concepts helps re-imagine your training program and helps learners grasp educational concepts in a fun and unforgettable way. Download now to get 6 actionable steps to help you prepare for incorporating gamification into your learning management strategy presented in a shareable infographic format.